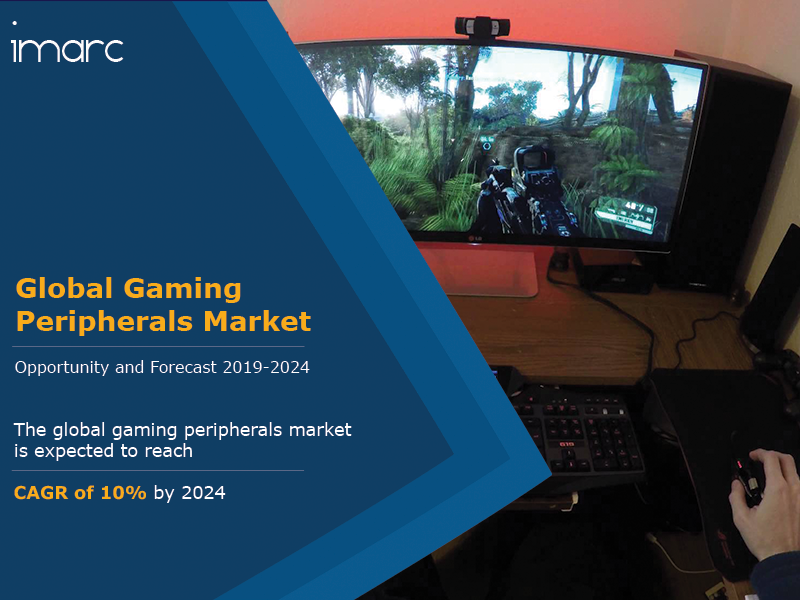 The global gaming peripherals market is expected to grow at a CAGR of 10% during 2019-2024. A Gaming peripheral is an auxiliary device that provides input and output for the computer and assists in enhanced gaming experience for the user. Gaming, in general, has evolved from board games and video games to a much more interactive and virtual set-up. With the introduction of PCs and the increased reach of the internet, there has been a significant growth in the development and commercialization of gaming. The gaming peripherals market can be segmented into various hardware products such as headsets, joysticks, mice, keyboards, and game pads. Based on the technology, it can be segmented into wired and wireless technology. An increasing number of hard-core/casual gamers and the growing popularity of e-sports are among the key factors driving the global gaming peripherals market. E-sports and virtual games have led to the development of special gaming keyboards and gamepads which can be customized and provide better ergonomics to the user. Consumers increasingly demand an immersive and realistic gaming experience that has created a need for superior quality gaming consoles, whole body sensors, peripheral devices, etc. Additionally, with the rise in the young working population, the affordability for gaming peripheral devices has also increased. Moreover, factors such as the introduction of augmented reality, virtual reality, high-definition displays, etc., are also projected to catalyze the growth of this market. IMARC Group’s latest report provides a deep insight into the global gaming peripherals market covering all its essential aspects. This ranges from macro overview of the market to micro details of the industry performance, recent trends, key market drivers and challenges, SWOT analysis, Porter’s five forces analysis, value chain analysis, etc. This report is a must-read for entrepreneurs, investors, researchers, consultants, business strategists, and all those who have any kind of stake or are planning to foray into the global gaming peripherals market in any manner. The report has also analysed the competitive landscape of the market with some of the key players being Alienware, Logitech, Razer, Mad Catz, Turtle Beach, Corsair, Cooler Master, Sennheiser, HyperX, SteelSeries, Anker, Roccat, Reddragon, Das, Gamdias, Sades, etc. How has the global gaming peripherals market performed so far and how will it perform in the coming years? What are the key regional markets in the global gaming peripherals industry? What is the breakup of the market based on the gaming device type? What are the various stages in the value chain of the global gaming peripherals industry? What are the key driving factors and challenges in the global gaming peripherals industry? What is the structure of the global gaming peripherals industry and who are the key players? What is the degree of competition in the global gaming peripherals industry? What are the profit margins in the global gaming peripherals industry?